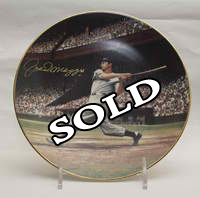 New York Yankees..... "The Streak", Joe DiMaggio Signed in Gold pen, Limited Edition Bradford Exchange. This plate has a minor rub near his knee but diffacult to notice and does not deminish the value of this piece according to appraisers consulted. The Reflection above his head is from the camera flash, not anykind of a flaw.